I defy you to find a woman who hasn’t ranted and raved at some point about a scar that just won’t go, often somewhere obvious that drives them nuts every time they see it. There are a plethora of products on the market claiming to heal and obliterate your average scar, but many of them contain all manner of nasty chemical compounds with side-effects a hell of a lot more unattractive than the skin they aim to treat. 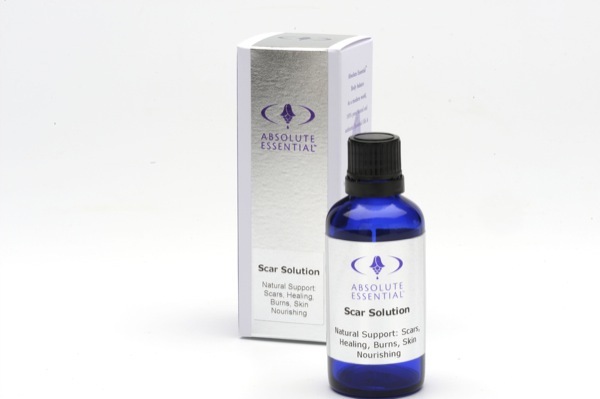 Not so Absolute Essential’s Scar Solution, which is nothing but goodness from the first drop. Developed as part of a private consultation with a car crash victim, it offers possibly the most intense concentration of super-food skin oils available today. Applied daily over a period of three months to already formed Keloid scaring, the exceptional botanical blend supported a natural reduction of raised scar tissue from half a centimeter to flatness. This is great news for many people who find out that cosmetic surgery generally only offers a 50 per cent chance of success against recurring Keloid scars. The pristine organic ingredients within it that work so beautifully together represent a supreme selection of the most therapeutic, nutrient-packed plant oils known to date. With regular application, the fragile skin is fed and kept supple and protected, while integrating molecular compounds promote healthy blood flow for increased nutrition and effective natural healing. It pretty much helps your body to heal itself in the most optimum way possible, which is no mean feat! For best results, apply it to the newly closed wound every day, followed by a gentle pressure bandage for Keloid scars to encourage flattening.